It is so incredibly easy to get bogged down in the traditions of Christmas, all the shopping, decorating, festivities, etc, and to forget the real meaning behind the holiday. While I’m not a Santa-fanatic, we still get gifts from Santa for our kids and let them participate in the “fun” of it, however our focus on Christmas is Christ. I was thinking of ways to keep my children’s focus on Jesus instead of the presents and Santa and came up with a few ideas I thought I’d share. Teach about Jesus year-round and not just at Christmas - The more your children hear about the goodness and mercies of Jesus all year, the easier it will be for them to understand the importance of Christmas. Daily read books and the Bible with them and encourage them to pray. Amanda gave some great tips on teaching your children to pray yesterday. Remember to put YOUR focus on Christ and not the traditions – Your children will see what you put the most importance on and will follow your lead. If you are more worried about presents, they will be too. The same goes for Santa Claus, if your family chooses to participate in that tradition. If you are constantly saying “Santa is coming”, your children will get the impression that Santa is the reason for Christmas. Encourage your children to have the giving spirit - Remind your children that we give gifts on Christmas in honor of Jesus. Just like the three wise kings who brought gold, frankincense and myrrh to the baby Jesus to show Him their love, we give gifts to those we love. Make it more about the giving than the getting. A great way to teach this is to have your child pick something out for another child who will be receiving gifts as part of a ministry. Your child will get to learn that giving makes them happier than getting. Read your children the Christmas Story – Reading straight from the Bible is always a good thing with your kids! You are speaking truth and love over them when you do and you are ministering and preparing their hearts for their future relationship with Jesus. Matthew 1:18-2:23 and Luke 1:26-38 and Luke 2:1-29 tell the story. There are also many books that are more on toddler and preschooler levels that tell the story without all the “grown-up” and potentially scary details. We currently have The Story of Christmas by Patricia A. Pingry and our kids love it. Decorate your house with more Christian items than “holiday” decorations – We currently have two nativity sets out that our children love to look at and talk about. We also made a construction paper nativity that takes up an entire wall. I did the major cutting out and my 4 year old drew faces on Mary, Joseph, Baby Jesus and the Angel. He also glued the pieces together and helped me hang everything on the wall. 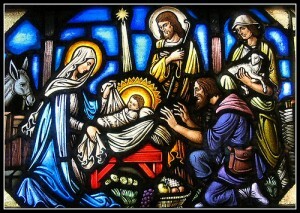 We also have the scriptures from Luke telling of the birth of Jesus printed out and on the wall above the nativity. Having a toy nativity, like the one Fisher-Price has in their Little People brand, is a great way for kids to learn and interact with the story. How do you keep the Christ in Christmas with your kids? I love these ideas, Christy! I am thinking about making a birthday cake for Christmas Day. I know I am falling short this year on getting my 2 year old to understand the full meaning of Christmas, but I hope when she can understand better next year we can really have more discussions and crafts focused on Jesus.